The Ĩyãħé Nakoda have always participated in sports and recreation activities. Adept in animal husbandry since the 1700s, horses continue to be bred and raised. Children naturally gravitate toward horsemanship. They are quick to learn and improve. They eventually participate in hunting parties, horseracing, and competitive games on horseback. 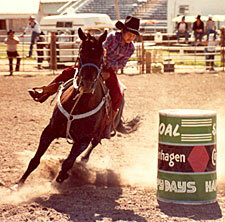 Since the early 1900s, youth and adults have been involved in the sport of rodeo. Many have won events at rodeos throughout North America. There have even been world champions! During the winter months, ice hockey is always popular. Through the years, a number of teams have placed well in league playoffs. Organized girls’ teams are fast becoming as competitive as the boys. Ice skating is also a pleasurable outdoor pastime. One can view youngsters enjoying themselves on a nearby frozen pond after the snow has been shovelled from it. Basketball and volleyball are popular pursuits, both competitively and for recreation. During the summer months, baseball fields are created in meadows, and families and clans gather together for games in the evenings and on weekends. Golfing, skiing, bicycling, skateboarding, and hiking are other outdoor interests enjoyed by many.